I have another (recorded) letter for you from Pixiegirl, too! Yay! Played beta but couldn’t loot. Monkeys on my head. Quiet week, with compliments of my ISP. - Doing dailies to get guild rep. Only took 83 to max out for the week. - Doing Ramkahen for head enchant, but only 2 dailies, so will need to swap to tabard once I have finished with guild rep.
- There's a quest in The Barrens that gives you the Going Down! achievement - the quest giver teleports you back to another quest hub and you drop exactly the right height! - Back in ghostlands questing at 22. Quest are green and mobs are much easier. Though there are still areas of high density and patrols that you need to be very careful in. Only problem is that taking longer to level now that the mobs and quests are green. - Decided I didn't want to venture in Deatholme, given that the main quest is a group quest, and there are lots of patrolling mobs. The brothers and I haven’t been playing much Warcraft, one of them found a tank game at PAX East. They all jumped on that for awhile but Sparkels and I can’t because there is no Mac version. That story is getting old. So Friday’s family night is a bit fractured right now. 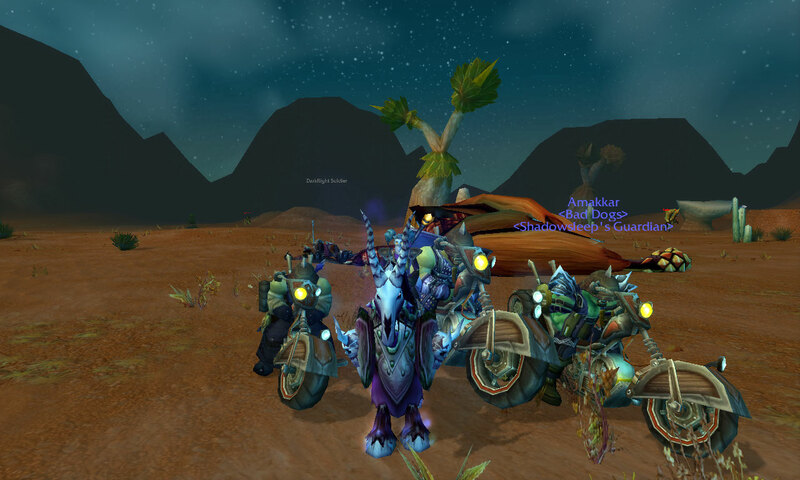 Sparkels and I dabbled with the Diablo and Pandaria betas. I received my Pandarian invite back in early March but just too even things out Blizzard made sure I couldn’t actually get into the game. It is now May 22 as I type this line and I still haven’t got my Mist of Pandaria beta to work on my account. When the Diablo beta became available I gave up on the Pandas and jumped into Diablo. Sparkels got her Pandarian beta invite in late April and got right in on the first try. She never got a Diablo invite. So we swap back and forth. I’ll play the Warcraft beta on her computer while she plays the Diablo beta on mine. I’m not sure Sparkels is really aware of what a beta version is all about. One morning in late April, while I was having breakfast and preparing to leave for work, I hear shrieks coming from the TV / computer room. When I entered the room she turns and rants a series of rapid fire questions without stopping for an answer. I was late for work that morning. However, I think I finally convinced her that during beta there are such things as server wipes and I have no control over it. I didn’t have the heart or stamina left to tell her that on May 1st the beta stops completely. I did eventually tell her when she was in a better mood. On April 30th Sparkels had yet to kill the Skeleton King. She cajoled me into an attempt at killing him but I couldn’t do it either, especially with her standing over my shoulder yelling. Yea, she gets intense. I think she is going to enjoy Diablo. I better stock up on the arthritis pain relievers. Upon hearing about the scroll of resurrection I started thinking about Gulta (his Warcraft name), our grandson. His account has been halted the past few months because he, his sister, and some school or neighborhood playmates have been playing something called Club Penguin. I was hoping I could steal his attention back to Warcraft, so I called. His mother told me he hadn’t been playing Club Penguin since the incident. She explains that one day Jolia, his sister, brought over a girlfriend. They both showed off the penguin game to the guest and all their in-game belongings and rewards which includes an igloo or their very own house. After about 20 minutes of this excited demonstration to the young guest, the girlfriend turns to Gulta and tells him his igloo is “lame”. “This just crushed him.” says his mother. “How do you know this still bothers him?” I ask. “Ah yes, the old hair gel depression test” I say, hopefully sarcastic enough to be detected. Now to move onto another subject, Durdles has been concerned that Jeppy’s absence has affected the Ctrl Alt Wow podcast. Durdles biggest concern was that a number of past episodes have been under two hours. At no time during this conversation did he express any empathy for Jelly’s health. Yes that is not a typo he actually refers to Jeppy as Jelly. When questioned, Durdles explained that he remembers names by associating each name with an easy to remember item. A common practice I said, but his name is Jeppy not Jelly. Durdles then reiterates his name associations and explains how he often gets lazy and doesn’t finish the naming relationship and just ends the exercise with the item name. I’m sorry folks, you can pick your friends but you can’t pick your relatives. He isn’t intentionally mean; let’s just say he slides outside social norms. Durdles was distraught by the shorter podcasts and mentioned that he had a plan to help make the podcast last longer. I mentally refused to ask for more details. The next time I logged on I found my mail box stuffed with a gazillion, gray items. When I asked him why he did this he said he wanted me to compile a list of all the strange and interesting junk items one could find in the World of Warcraft. So that I would write in a long list and this would help the podcast get back to its long podcast time. Then he added that he also wanted to see if there was a limit to the mailbox and just stuff my mailbox with junk so I would have to spend lots of time emptying it. So, not wishing to bore the listeners with Durdles complete list, I condensed the list to some of the more interesting and less common gray items. Hi Aprillian, Ashayom Tedra and this weeks wonderful guest host! Hoping Jeppy is getting better and everyone is doing well! Just emailing early my update this week as I'm out of town. This week has been full of Diablo 3 it was awesome today I even got a Oh my goodness not another podcast and I must say Dreams did a really lite edit. Hey Caw crew, BIG welcome back to Jeppy, Yay!!!!! Quick update, All is well with the Nekrobobs. Lastkiss the Rogue level 80 and working through Hyjal and Skylla the Loremaster toon had a terrible time completing Nagrand because she didn't do that silly "follow the big blue guy" quest in Shattrath city. (she hates that quest) She went back to Shattrath and did the blue guy quest then she had to go to Shadow Moon Vally to do half a dozen Skryer quests. Then the Skryers sent her back to talk to Altirus the sufferer who finally gave her the last few quests she needed to complete the silly Zone. Was it that crazy when you guys did the zone ? 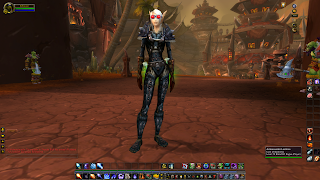 Just a quikc check in e-mail, as me and morgaine both had little time to play WoW this week. I tried to get my rogue to 20 but got stuck on a quest in the northern barrens, where your suppposed to kill a bunch of centaurs till the boss spawns, well the boss appeared then preceded to 2-3 hit me. I must have gotten killed by it 7 times before I just gave up and logged out. I managed to convince a friend of mine to come back into the game, and he rolled some toones horde side on earthen ring to team with me there, so that is fun. Other then that though, that was our week in WoW. For the alliance, for the horde, for the oh lord where is all my free time! PS: Thank you Peterrabbit for helping me craft stuff for my friends new toon, you rock! Aprillian, Ashayo, Tedrah and Gufoni discuss another week of playing World of Warcraft, Blizzard's great MMORPG. Contest Ongoing send an email to ctrlaltwow@gmail.com telling us how you play WoW, either as an altaholic or dealing with it in your family life to being placed in a drawing for a WoW Pet or an Authenticator. Hello Darlings!! I hope everyone's doing great... here's my CAW269 submission and it includes a fun message from Pixiegirl! An hour or ten of Diablo III :) Wizard to 20, Hunter to 10, Witch Doctor to 10, Monk to 6. Cinematic after Act I was awesome! Hiide - did 20-25k dps in WoE ! Actually did highest amount of damage done! Quests 1912 - 2604 = 92 quests. Now 98% into honored for the guild. Weird bug with misdirection - was stuck on constant cooldown. Fixed after hearthing. - went to razor hill to pick up from there, but they were grey. - ding 20, trained right there in cross-roads! - Dumbass warlock flew back to Org, caught zepp to Undercity, ran to Silvermoon portal, ran all the way out of silvermoon to the Hawkstrider vendor .... only to realise I'd already trained by getting the warlock felsteed! - After finishing the samophlange quest line, Spluttervalve gives you a rocket ride back to cross-roads - trepidation to take it as an Ironman toon! Mel and I have been so busy in real life that WOW has taken a back seat for a little while. We did get a few new pets from children's week for a few toons and with one toon we did the whole thing. We both hate with a passion the " school of hard knocks " achievement as it is such a negative achievement. Anyway we were luckily in Warsong Gulch on our 5th or 6th try we had groups that wanted the achievement and the flag fell really easily. The other three were just painful and 6 times I almost had the flag placed in the base or got the fort almost caped and we won the battle ground . Talk about " not happy Janet" . The Nekros asked us last weekend if we would like would like to take a level appropriate toon though Hellfire citadel as he was after the daggers off the second boss for his rogue . Not being greedy but being muti-boxers we bought along two and we ran the normal instance 4 or 5 times and soon we ran out of rested xp and the daggers never dropped. Anyway real life called and Mel and I disappeared for a while . When we logged back on much later Nekro whispered us that daggers only fall in the heroic version of the instance . "Doh"
So you may ask what made this a " very happy event" and that was that we were on vent with Nekros and we head Mrs Nekro laughing and chatting in the background and to hear the wonderful news that she is on the mend after being sick for so long . May the cockroaches beat the canetoads this year . PS We have no trouble understanding the big G but did Ashayo have to translate the last 3 lines ? Good morning CaW crew. Hope everyone is doing well both in and out of game. Its been a fun week in wow for Mr. and Mrs. Necrobob. Lastkiss my Rogue is now in Northrend collecting stylish daggers and learning the delicate and dangerous art of engineering (mostly so she can wear all those cool goggles). While running Utgarde Keep she discovered the Riplash leather armor set. Its the dark blue set with the fur trim on the shoulders. She only needs the Riplash gloves to complete the set. If anyone has a pair kicking around let me know. Skylla, Mrs. Nekrobobs Loremaster toon, has recently finished Hellfire peninsula, Zangarmarsh and is well on her way through Terokkar Forrest. Aside from that we had to do another massive bank and mailbox clean-up. Because of this we have a new policy with gear, if it doesn't look pretty sell it on the auction house. if it doesn't sell it gets disenchanted. Do you guys have any rules or methods regarding gear and what to do with it or do you just leave it in the mail and pass it from toon to toon. The Voice of Liquid Sin! It was very nice to hear Gufoni on the podcast. I remember fondly his conversations with Warrak and Dills on the AIE Podcast and his segments on Arezzo's fantastic Postcards from the Old World. On Friday nights I have been hosting Ulduar achievement runs on Earthen Ring. I’m still learning the best approach to the fights at level 85 as well as how to explain the fights better. Typically we get started around 11PM EST (server time). It will take at leasy two runs for one toon to get all of the achievements. When my schedule permits I’ll do a follow up raid on Saturday nights. The only requirements for the raid is to be level 80 or higher and have Mumble installed on your computer. Mumble is an alternative to Vent and it is free to download. I have my own 30 man server allowing folks from different guilds to join us. You do not have to have a working mic but I do need you to be able to hear my instructions. When Blizzard starts using Battle-Tags in WoW instead of Real-ID I will I’ll be able to open up invites to anyone with a Horde toon on a US server. The goal of these runs is to complete the Glory of the Ulduar Raider achievement and earn folks the Rusted Proto-Drake. If we have more than 10 people on a given night we can switch to 25 man and work toward earning the Ironbound Proto-Drake. When Jeppy gets better I will schedule some runs at times that are better for people in the UK. Wingy here with an update. So many things accomplished with so many more to come. Man I love this game. Well, to be honest, WoW play wasn't extremely epic this week. I was busy preparing and having my callback for a theater production (Which I just accepted the role of Marian...in the show "The Music Man", and Wren got cast as the prankster kid Tommy, hehe). But when I wasn't busy with that or WoW, I was enjoying watching Wren play and beat Diablo 3 on his barbarian. He started out playing a witch doctor, then decided to try some of the other classes and quickly realized his barbarian felt the best fit- since after all, he adores tanks. When not fasinated by all the demons and beauty that is Diablo 3's cut scenes, I did play a tiny bit in WoW land. 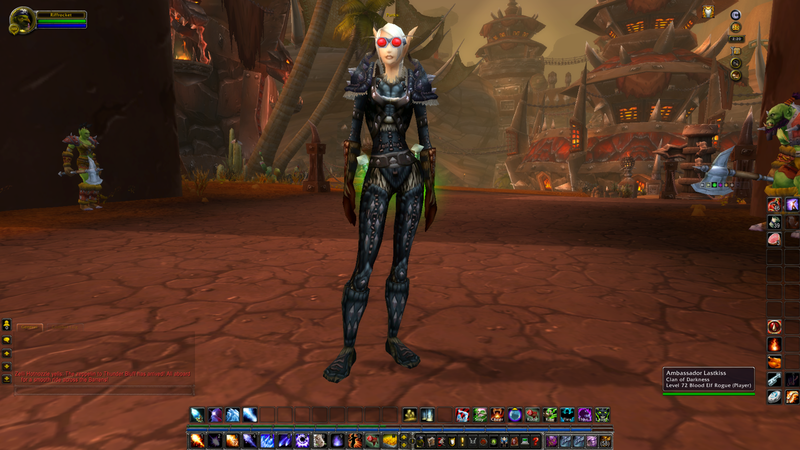 I got my Tauren hunter Striderunner to 22 and my undead warlock to 49 1/2. First I sent my hunter off to Ashenvale, where I proceeded to join in the fight against night elfs, then later rode the most awesome of kodos- Brutusk. I wish my tauren's kodo could zap 8 ashenvale ambushers with one stomp! After defeating Kalaran the Annihilator, Moldarr and then General Jirakka, I was pretty sure we could take on anything. Then Nyxondra happened. That crazy dragon...argh. After clearing out a huge radius of her baby dragons because I knew she had a fear, I thought we'd be ok. But nooo, her babies respawn so dang fast! I kept getting her down to 20% then my Bad Dogs would die on me no matter how many heals and spells I threw at them and her. Sadly without my warlock pet, I am not nearly as badass alone. I soulstoned and tried again. Same thing happened, around the 20% mark- the bad dogs and myself-dead and squishy. Frustrated, I hearthed out, trained up and left my warlock sitting in Undercity to stategize her next move on how to beat that crazy dragon before I pulled my hair out. Sorry that there is no song today. With all the real-life theater stuff and Diablo 3, we didn't get a chance to do one. *tear* I hope you all had a lovely week in WoW and that those who got to play Diablo 3 enjoyed it as well. I haven't spent alot of time in WoW this past week besides checking Auction House and doing a LFR on Friday night (got a new trinket for Leeta). No levelling of my Iron Man Toon, no Alt levelling. WoW has been particularly low key for me. Yes Diablo 3 has hit and oh my gosh I am loving it. I made a Wizard and managed to stumble around like a complete noob for the first few hours until a friend explained some of the game mechanics to me. Now I have never played Diablo or Diablo 2 and couldn't get my head around Starcraft 2 however Diablo 3 I am slowly getting the hang of. And I am LOVING it!! It won't replace WoW for me however it is really nice to just have abit of a break from it. Well that's is about it for me this week. Hail and well-met, Control-Alt-WoW crew! It’s been a while since I last sent you a missive. I’ve still been at the same-old thing, working on raiding with my Tauren Paladin, off-tanking and melee DPS. We’ve managed to start working some of Heroics in Dragon Soul with Heroic Morchok on farm status. We’re working through some of the Achievements in DS as well. We’re going back and picking up some various pieces in the Firelands too. But, the real reason I’m writing was that I realized on my drive into work today, I wanted to hear the EU and AU versions of our favorite Diablo (D3, etc..) character, Deckard Cain. So, can we have some input from Ashayo and Jeppy? What does the EU Deckard Cain sound like? And what about the AU Deckard Cain? Thanks for my little interjection! Apologies again for no audio this week! I did actually record one but realized when I was literally 20 feed from work that I'd forgot to email it. What I've been upto: I had a minor crisis with my Laptop HardDrive not working at all last weekend. It just wouldn't power up or boot. I then removed the battery and the power lead, left it 10 minutes and when I came back it was powering up just not booting. I removed the harddrive fo r 10 minutes, put it back in and voilà fixed. I spent a little bit of time on my Rogue Rigarmorty in Uldum and popped onto my warlock but I didn't get a great deal of gaming done. I have been thinking of rolling a pally alt at some point, possibly on Nevikhoof. I'm going to be a guest again on 5WowThings www.5wowthings.com on Wednesday so that's cool. Putting out my episode 7 later this week as well. Other than that I'm off to Brighton which is on the southern coast of England for a long weekend.